Hi! I’m Jet, originally from Liverpool, now living near Nottingham, UK. On Fri 4 Feb 2011, at the age of 49, I was diagnosed with multiple myeloma, a cancer of the plasma cells in the bone marrow. It is fairly rare, especially in women my age. More often it affects older men. At present it is deemed incurable, but treatable. I am lucky that Nottingham City Hospital is one of the UK’s centres of excellence in Haematology and in treating myeloma. For a brief overview of my medical journey, please take a look at the Catch-up: Potted History. I am now 52 and currently in remission. I chose to keep a web-based journal to record my experiences of living with myeloma. I write about the medical, practical, physical, emotional, philosophical and creative aspects of my experience. It is mostly for my own benefit, but I hope it will also be of interest/helpful to others – friends, family or other people living with cancer. Of course, I am more than just a myeloma patient and other aspects of my personality and my life crop up in my writing, but the main focus is on how I am living with myeloma. Jet you truly are one amazing woman!!! Jet i’v just read some of your blog (will try and read it all soon)got in to it from he myeloma forum and find it very interesting. As you i was diegnosed with m.m on the 1st of March this year and started with the treatment At the moment i’m off all my tablets and waiting to go for harvest.You seam to be away ahead of me!!! It sounds as if your going threw hell and i hope it gets better for you soon. Looking forward o reading more of your blog later. Sandra. hello friend I am struck by the amount of trauma that has happened to so many i know just this year alone. I shattered my right elbow (radial head to be exact) 2 days after your diagnosis. I lost numerous friends this year accidents, illness, suicides. I don’t have an answer an am left with more questions an heaviness. There is no point to my share only that i will read an learn an continue to have compassion for those i come in contact with on a daily basis an thru your blog an others like you who share their story. Thank you Jet. It’s corny but true Goddess Bless your heart an continued improvement on all fronts. Best of luck to you Jet. If it’s any help (it might not be). My mum was diagnosed with a rare form of bowel cancer in 2002. She had treatment and surgery and now has more energy then I do. Hi Jet, I found you on Cheryl Beers status via facebook. If you are up for it, please let me know via any of my contact details, but preferably via landline as it would be easier to link with you when i hear your voice !! Thank you so much for the offer. I am not sure how I feel about Reiki, but I may willing to try it. 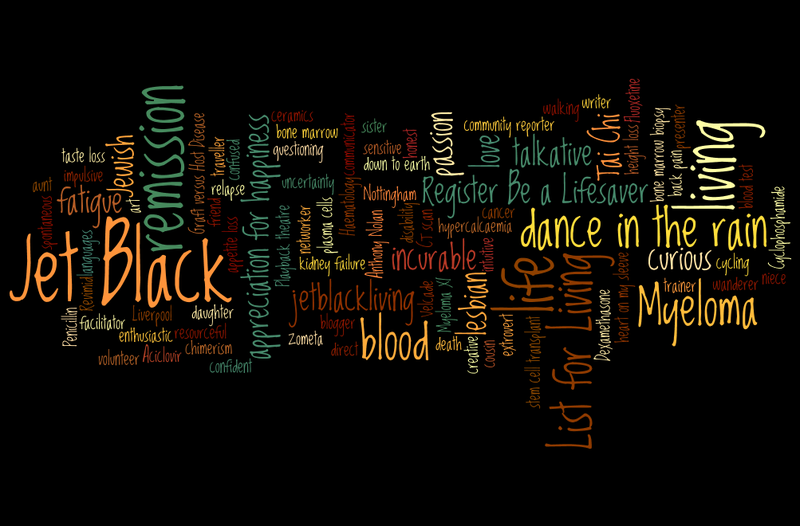 Jet, I came across your name on the multiple myeloma group on Facebook, and went on to read a bit of your blog. We may be seperated by miles, but we share similarities. I’m a 43 year old Jewish woman living halfway between New York City and Philadelphia in the US, living with my boyfriend, our two cats, no children in a beautiful and very historical area known for its artistic/gay/lesbian/spiritual/biker friendliness called New Hope which runs along the beautiful Delaware river and its surrounding cliffs. Its a very unique place, and beautiful. Neighbors can include gentleman farmers on 200 year old estates, round solar powered homes occupied by spiritual “hippies”, a gent with a large car collection, an avid hunter, a man who had an authentic chinese tea house put on his property and more! Just 6 months ago, a hot air balloon landed in my front yard. I thought it was an emergency landing, but the “pilot” informed me that when the balloons want to land, they do, on whatever large tract is available. He then told me that the homeowner he disturbs by landing there is asked to indulge in a champagne toast. Sitting on my lawn as the crew that pulled up in van packed the balloon up and drinking champagne with the pilot and the couple who were actually taking the ride, i thought “this life of mine never fails to throw me boomerangs”. Feel free to land here anytime! Though I have some pretty rotten days, I try to keep life normal, and, even more, try to embrace it. Not always easy…. I don’t blog, but keep a journal, and often post pieces of it…along with a good sprinkling of whining, and good old keeping in touch with friends on Facebook. Get well and my heart is with you. You are brave woman. Thank you English dad, for reading and your kind comment! I’ve taken a quick look at your blog – looks interesting. If I find the time, I’ll check it out. Hey Jet – you are a very special lady. Hope that the treatment continues to improve your situation. Thinking of you. Ah thanks Chris. And thanks for reading. Good to be back in touch. Jet; My name’s Chris Howard and I’m an author living in rural E.Anglia a the moment writing a fictional piece concerning leukemia. I was intrigued by the mention of cream or powder – what was it for – not cocaine I hope, although I wouldn’t blame you one ounce!! Thanks for reading. Nice to connect with another writer. I’m not sure which mention of cream or powder you are referring to, as I don’t mention either in this post. If you comment on the post where I mention it, I should be able to elaborate. But you’re right, it wasn’t coke. But maybe that’s something to add to my List for Living as I’ve never tried it. LOL! Hi Jet, I came across your blog last week. We have the same type of myeloma, are similar ages, and appear to have relapsed within the same time frames between 2 treatments. I’ve found your blog so helpful, it’s a great blog and the ease of reading has made it so much easier to get straight forward information on Myeloma that I e not found in one place until now. I wanted to ask you some questions regarding BJ Myeloma and wondered if I could personal message you about it? Hi Jet, Sorry to hear you’re battling with Multiple Myeloma – I found a link from the Myeloma UK twitter feed to your blog. I fund-raise for MUK following the great support they gave my late husband. Good clear information and de-mystification of the illness is so helpful and we found it’s better to talk about it than to ignore it. Keep up the good work! Hi Si. Good to have you on board and raising money for MUK. I’m sorry to hear that your husband died. That must still be hard for you. I definitely agree with talking about ‘it’… whatever the ‘it’ is, rather than ignoring. And glad you find my blogs informative. I’m glad my blog was helpful to you. Best wishes for your health, treatment and a good remission. Thanks for your comment. Yes, I’m alive and well, in remission for over four years, although I do have a cough and cold just now. I would like to be writing more and there are still things to write about in remission, but I find it hard to concentrate on writing or reading, thus the hiatus. Maybe I’ll get back to writing again if I can find a way to focus for long enough. Like Lynne I’d wondered how you were going. Glad to hear you are still in there dancing, so am I although not much dancing. I don’t know about you, but I don’t want to be described as a myeloma patient/survivor any more. I just want to make life as good as I can and do what little I can for others on the way.